The Indian Society for Training & Development (ISTD), established in April 1970, is a national level professional & non-profit society registered under the Societies Registration Act, 1860. It has a large membership of individuals and institutions involved in the area of training and development of Human Resource from Government, Public and Private Sector Organizations & Enterprises; Educational and Training Institutions and other Professional Bodies. The Society is affiliated to the International Federation of Training and Development Organizations (IFTDO), Geneva and Asian Regional Training and Development Organizations (ARTDO), Manila. 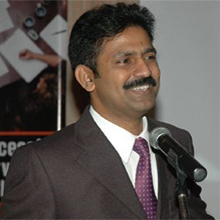 Dr R Karthikeyan National President, ISTD(2016-20) heads Gemba Management Consulting Pvt. Ltd. He is a clinical psychologist with an M.Phil from NIMHANS, Bangalore & Ph. D from University of Madras. The Indian Society for Training and Development (ISTD) is a premier institution in the field of Human Resource Development with a distinguished record of service spanning more than 37 years. To meet the long felt need for a basic qualification in Training & Development, a focused correspondence Course-Diploma in Training & Development was introduced in April, 1979. This is the only professional course recognised by Govt. of India for training of trainers in the country and is designed to meet today’s Training/HRD challenges. This Diploma Programme is managed by a Board consisting of eminent HRD professional and academicians. At present a large number of ISTD Diploma holders are occupying senior positions in the field of Training & Development/Human Resource Development in various Central Government Departments, Public and Private organisations. Join the ISTD Diploma Course today..! The Association for Talent Development (ATD), formerly American Society for Training & Development (ASTD), is a non-profit association dedicated to those who develop talent in organizations. ATD was founded as ASTD in 1944. It has more than 5,000 members outside of the United States from more than 120 countries. ATD supports conferences and events around the world. It also work with partners worldwide to develop and support a global community for learning and HRD professionals. ARTDO International was founded in 1974 in Manila for a shared vision and a call to action to ILSthrough a unified approach. Today it is an international umbrella body with membership comprising national organizations, educational institutes, multi-national corporations, public and private enterprises, HR management specialists from well over 30 countries worldwide. International Federation of Training and Development Organizations (IFTDO) was founded in Geneva, Switzerland in 1972 in order to develop and maintain a worldwide network committed to the identification, development and transfer of knowledge, skills and technology to enhance personal growth, human performance, productivity and sustainable development. IFTDO is the most multinational, multicultural Training and Development organization in the world with a truly diverse Board of Directors leading the organization. Our members form a highly diverse network of human resource management and development organizations globally, linking HR professionals in HR societies, corporations, universities, consultancies, government organizations and enterprises. IFTDO currently represents more than 500,000 professionals in over 30 countries.